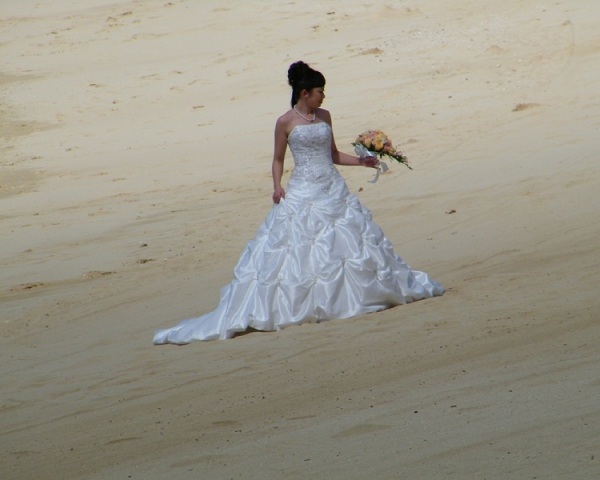 Hawaiian beach wedding dress is a must if you are planning to have 'Hawaii' as the theme of your wedding. Read on to know more about Hawaiian style wedding dress. Traditional weddings are slowly paving way for weddings with an offbeat theme. While yester years' 'to-be' brides and grooms had their wedding in a conventional style, the same does not hold true in the recent times. The would-be couple, today, explores more ventures and wants the wedding to be a contemporary, yet conventional affair. Hawaiian beach wedding theme is gaining popularity with the passing time. It gives a tropical feel to the whole scene and adds that extra bit of 'romance' that beaches are characterized with. In case of Hawaiian style wedding, choosing a dress is the first priority. While many women like the traditional outfits, there are some who would be in sync with the theme of the party. You can go for an island-styled dress that lets you feel the romance of the islands. Another option is a Hawaiian wedding dress, or holoku - as the natives call it, which looks good in all colors. As for the colors for the dress, they can range from the elegant white to the ecstatic black. The dress you choose should complement your body type. You can either go for a fitted dress or wear a loose one, which would sway with the wind blowing. Talking about Hawaiian beach wedding dress, lacey ruffles in the bottom can work perfectly for some women. However, there are others who would prefer the mermaid-style dress that is made to hug your figure, with a wider edge at the bottom. The other varieties include strapless dresses, spaghetti-strapped styles, halter dresses. Remember that the dress you choose must reflect the beauty of the island. A black dress with pictures of the radiant surroundings, in bright colors like red, green and yellow, goes very well with the nature of the party. If you love subtle colors, pale shades of yellow, green, pink, or blue, with delicate flowers or patterned leaves, make up just the right choice. When you sport the Hawaiian wedding dress, it is very important to accessorize it too. You can enhance the look of your dress with lei, made from silk flowers or delicate shells. Popular lei shells include the koa, puamana, and Ni'ihau shells. Pearl, kukui nuts, shell strands, freshwater pearls, and mango wood can also be used to craft jewellery for the 'big day'. Some of the other options present are flowered wedding veils, delicate hair combs, decorative fans, flower hair decorations, and paper parasols. Go ahead and pick the dress that flatters you, yet makes you feel comfortable. After all, it's your wedding and you have to look the best!